Look at the hues of the building your concrete color will enhance. Keep it simple. Instead of picking contrasting colors, choose colors that harmonize well with the existing building's roof, siding and trim. 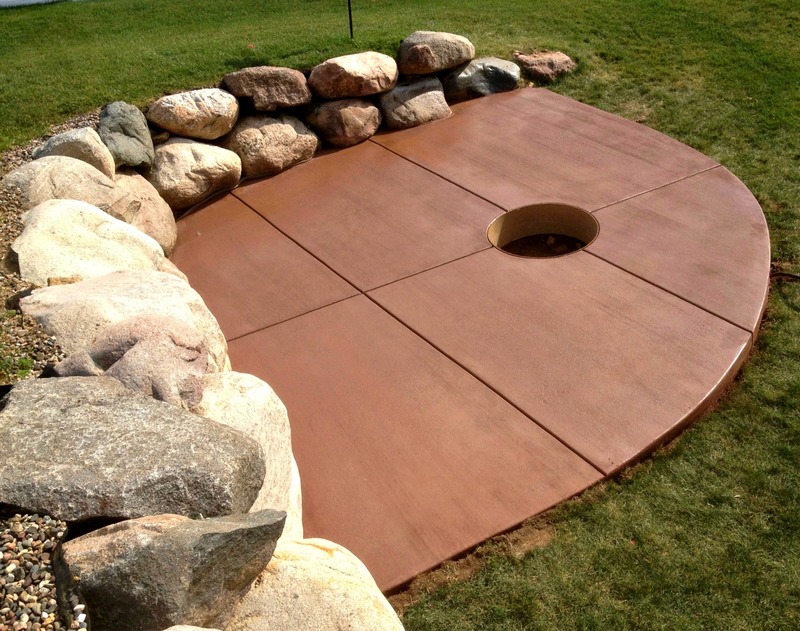 Incorporate these hues or complementary colors into your concrete work. 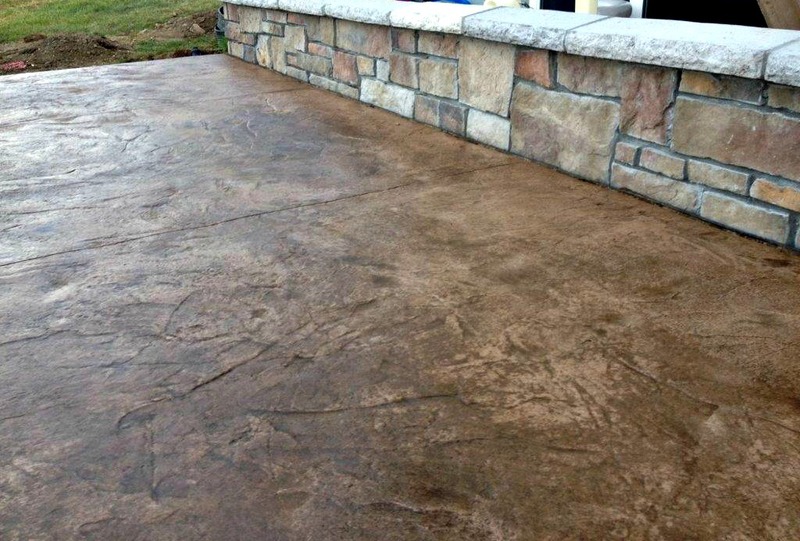 Stamped concrete color should imitate a natural stone, paver or wood planking. These materials rarely have just one color throughout. 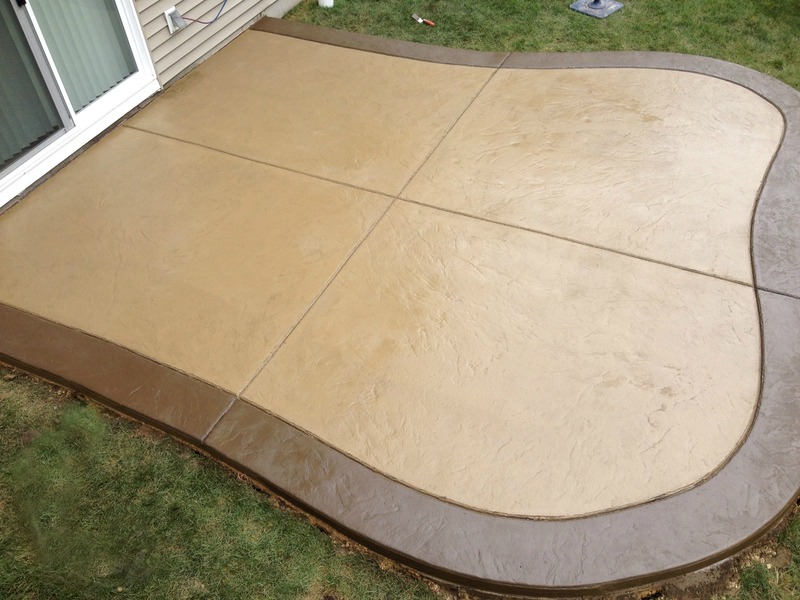 Therefore, the color of your concrete for stamping should also carry some color variations. 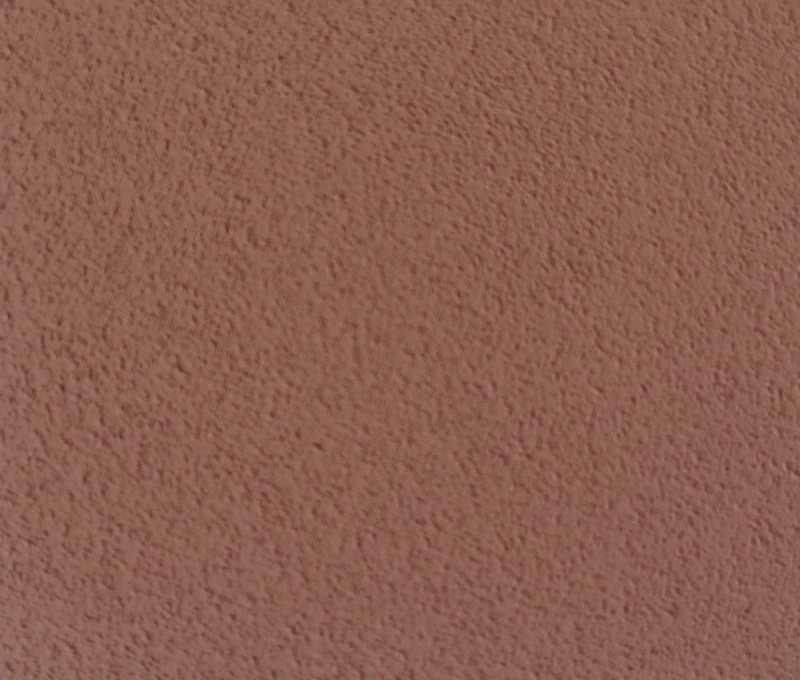 Integral - This color is mixed into the concrete at the batch plant. 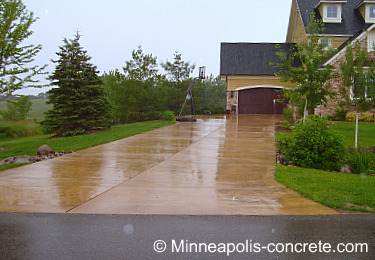 It will produce one, uniform color throughout the entire width of your concrete. This is beneficial if the concrete ever gets chipped as the color can't be removed. 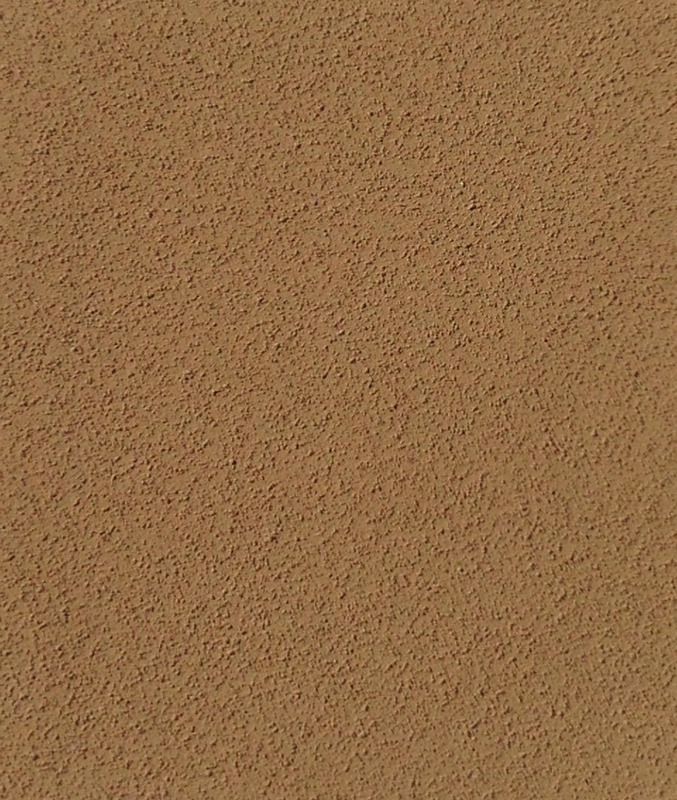 Dakota Clay is a basic brown earth-tone color that complements warm color palettes and deep brown trim and landscaping. It looks great against woodwork or stonework that has variations in brown hues. The picture above has Dakota Clay as the base with mocha accent colors in an Italian Slate stamp pattern. 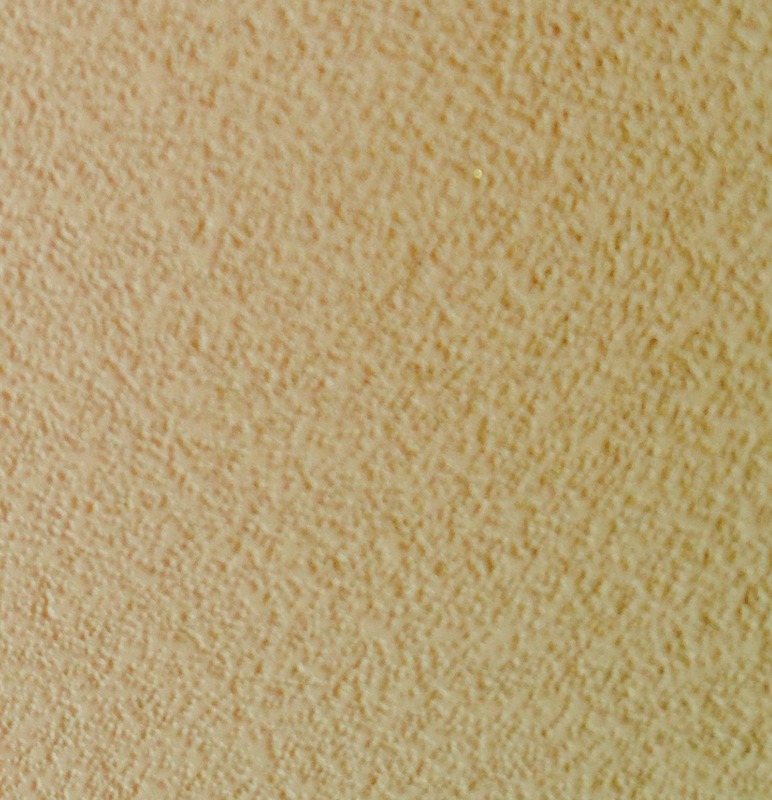 Mankato is an earthy color that appears as a light beige. It complements about any color palette and is a color incorporated into most stone patterns. This is the safest option if you're having problems picking a color. No accent color has been applied yet in the picture above. 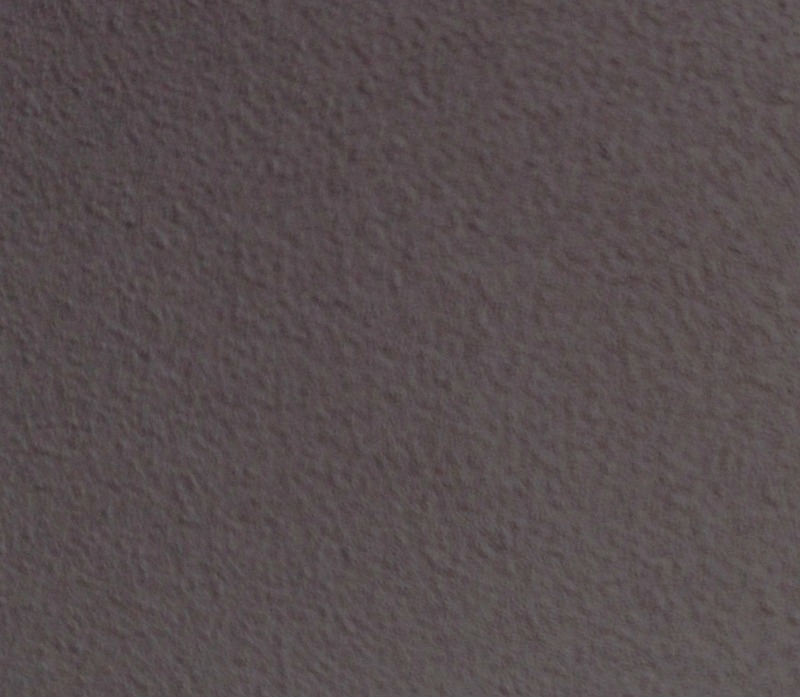 Grey Cloud is a darker grey color that mimics natural granite stone. It accents deep grey trim on surrounding buildings or grey rocks and borders in landscaping. It blends beautifully with blue, gray or white houses. It looks especially great with stone or masonry work that incorporates cool colors. Stony Isle is a lighter version of grey cloud. It mimics a lighter granite stone color. It works with any cool color palette where deep intensity is not desired. A particularly striking use of this color is to accent the surrounding landscaping with deeply colored flowers in purples, blues, and reds. 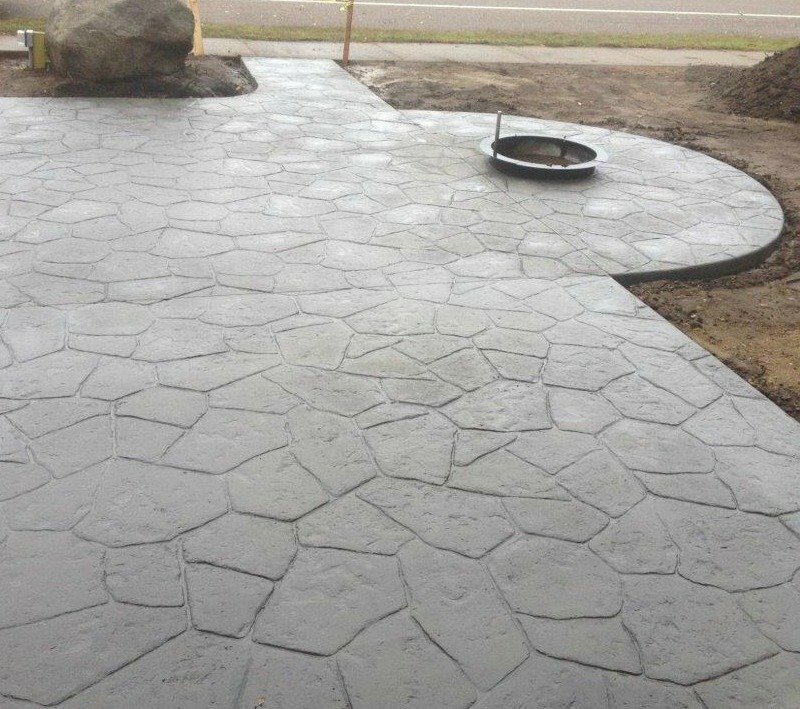 The stamped patio pictured above is patterned in Canyon Stone. Pipestone is a basic brown color with red-spectrum overtones. This creates a warm, rich feel. It complements cedar homes and buildings and stones with warm tones. It works beautifully in applications where more warmth is desired. 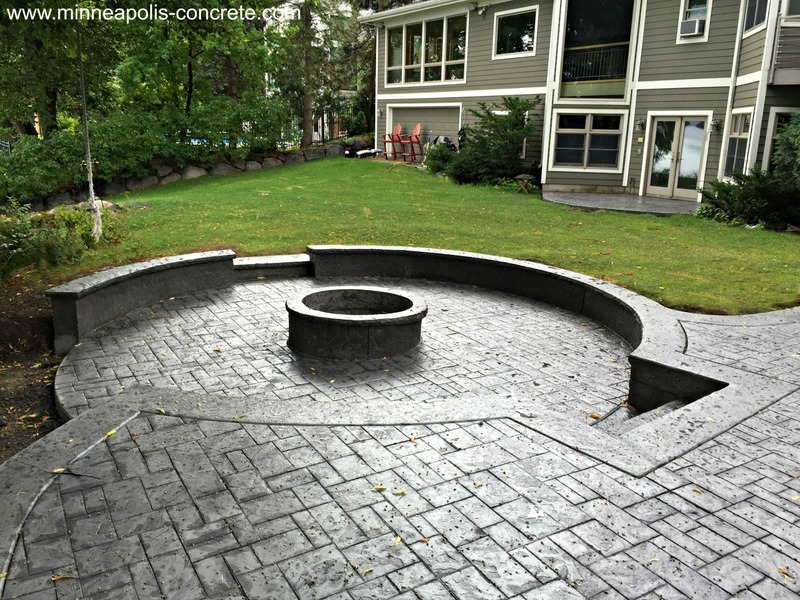 The patio pictured above has a broom finish (no pattern) and a firepit for entertaining. 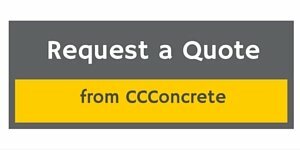 Dry-shake Concrete Color Hardeners - This is a great option for brighter and unlimited range of colors, but it only affects the top 1/8 to 3/16 inch of the slab. 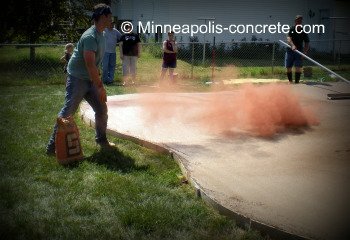 The powdered, dry-shake, color hardener is spread out on freshly-poured concrete and bow-floated into the surface before imprinting. Powdered or Liquid Release Agents - These not only impart subtle color, resulting in an antiquing effect, but they also prevent the concrete stamps from sticking to the concrete. (1 cup of powdered release is needed to tint 5 gallons of liquid release). 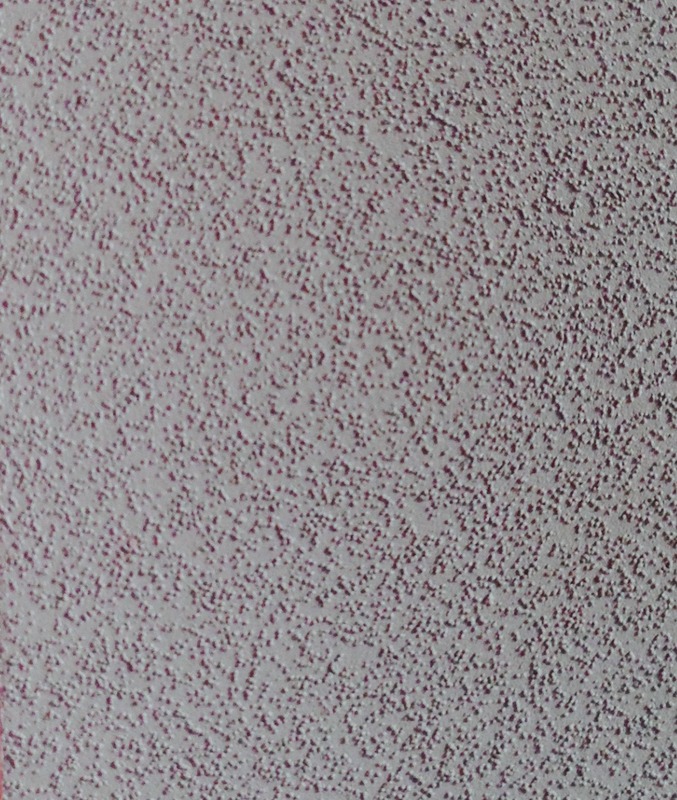 Because the powder is difficult to control outdoors (wind can cause it to spread to the siding of the building or other surfaces and color them), and it is a health hazard for the contractor to apply (it is essential to wear a mask during application), many contractors are using clear liquid release and tinting it with powdered release. Some contractors believe the color is not as impressive using this method, though. Stains - These are applied after the concrete has cured. This creates a very natural look with lots of color variations. Since stain is only applied to the surface of the concrete, later chips or damages will expose the grey/white concrete beneath the stain. Click stained concrete for more information on stains. Dyes and Tints - Dyes are often used in conjunction with stains for even greater color intensity. Dyes can produce very bright, vibrant colors but may fade when exposed to ultraviolet light (generally a 5-10% color loss). Tints add hints of color and can produce some faux-finishing effects. Mix a pigmented powdered release with a solvent acrylic sealer (do not use water-based acrylic). This way the sealer itself acts as the color wash. Also, a more subtle effect is to combine several handfuls of color hardener with water in a pail. The tinted water can then be applied to the concrete by spray or sponge. But if you use this method, you must lock in the color by applying several coats of sealer. Choose a primary, integral color for the base mix and then "flash" or dry-shake a colored, powdered hardener on the surface of the concrete in 4 or 5 different accent colors. Choose a light concrete base color and apply a much darker release agent for contrast. Would you like a bid on your colored concrete project? If you live in the Minneapolis and surrounding suburbs area, fill out a bid request form.